Its simplicity of installation makes WELLMASTER 250 the cost-effective alternative to rigid polyethylene, PVC or galvanised pipe. WELLMASTER 250 is manufactured from high tenacity synthetic yarns, circular woven and totally encapsulated in a tough elastomeric polyurethane lining and cover. The riser has an integral textile reinforced rib for location of the power cable strapping system. Wellmaster is the only flexible rising main approved under Regulation 31 of the Water Supply (Water Quality) Regulations. 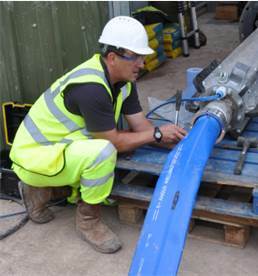 This means it is the only flexible rising main permitted to be used for new installations in private and public water supplies. Section 1 - Introduction to the Wellmaster coupling components.